"We went to Coronado for Jeanette's birthday weekend. We stopped at a favorite spot of ours in San Diego called Extraordinary Desserts. I almost put myself into a coma with the chocolate tiramisu, but it was completely worth it. They have amazing desserts." "I always feel so lucky to be able to visit Coronado. We have just started a little project there I will tell you about in the future. Oh, Extraordinary Desserts is not to be missed. Funny enough, my favorite thing there is not a dessert but is the kiwi lemonade. I also had a grilled cheese with gruyere and grilled onions on a GLUTEN FREE english muffin - delicious birthday treat!" Still time to enter the necklace giveaway - here! Oh my giddy aunt! 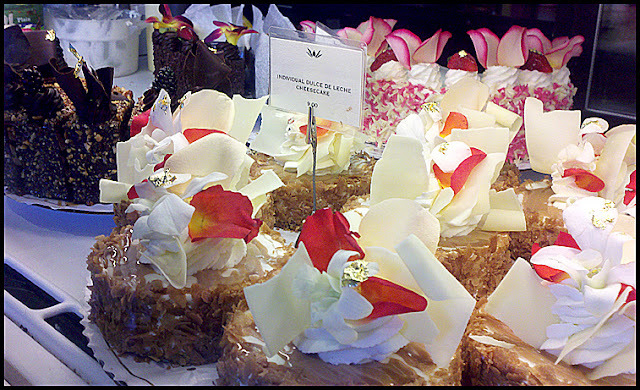 Are they petals or chocolate on top of those cakes? Either way they look sensational and my teeth hurt just seeing them here. PS: You got an extra birthday wish today J when I saw a feather falling into my neighbours yard. SO TASTY! I'm jealous I missed out, but so glad you had fun. Aw! I love that your hubs and you go on sweet dates! Great way to celebrate! The Devonshire Cream Napoleon wasn't too bad either!!! tiramisu... no doubt about it! have a great week! aw that sounds good, i hope you had an amazing bday!! as for my fave dessert? I've never met any dessert I didn't like! Hope you had a wonderful Birthday weekend! I have heard about this place, and now I have to go check it out! I love when you do these posts!! had an amazing apple tart yesterday-yum!! WOW! I thought we had it made a Sweet Pete's! But this is AMAZING! So glad it was a fun birthday celebration! wowzie! I bet your husband's glad you had a birthday for more reasons than one now! And your meal sounds heavenly. Glad your celebration was so wonderful Jeanette. yum yum yum! i want to go on a sweet date! gorgeous desserts. i probably should not find out the address!